Shortened URLs and QR codes have been life savers for giving out website URLs during class. Because no matter how organized you are, writing agendas or posting on calendars and linking websites students will need for class, there’s always one that just comes to mind. Or discussion leads to a new idea. 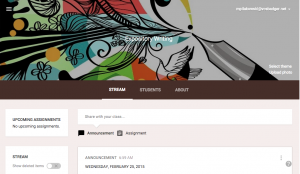 Or you think of a site that will be a great resource to students as they’re working. In the past, I’ve shown the shortened URL (we use laptops in my room), but there’s still the delay of everyone typing it in. Plus, the question: Is that a capital I or a lower case l? But now there’s Chrome Tone! One press of this extension button, and your current webpage is broadcast to all Chrome users within earshot–including over Google Hangout and the phone. A small window pops up on everyone’s devices, and they can choose to open it and go to your website or close it. What once took one or two minutes now will take seconds. Maybe that doesn’t seem like a big deal, but when your lesson is flowing and you have that teachable moment–well, one to two minutes definitely disrupts the flow. But say your students use iPads or are BYOD. Check out Chirp. This will send the websites to devices. Check out my other favorite extensions here. 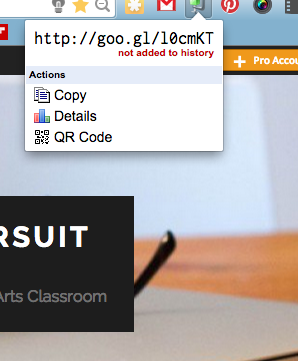 If you use Google URL Shortener, you’ve seen this same drop-down menu that I’ve seen thousands of times. Until this week, however, I’d never checked out the “Details” option. Let me tell you: it’s pretty cool. By looking at the details, you can see how effective your shortened URL is at streaming traffic to your page. Above is the details page for my Chrome Extensions page on my website. 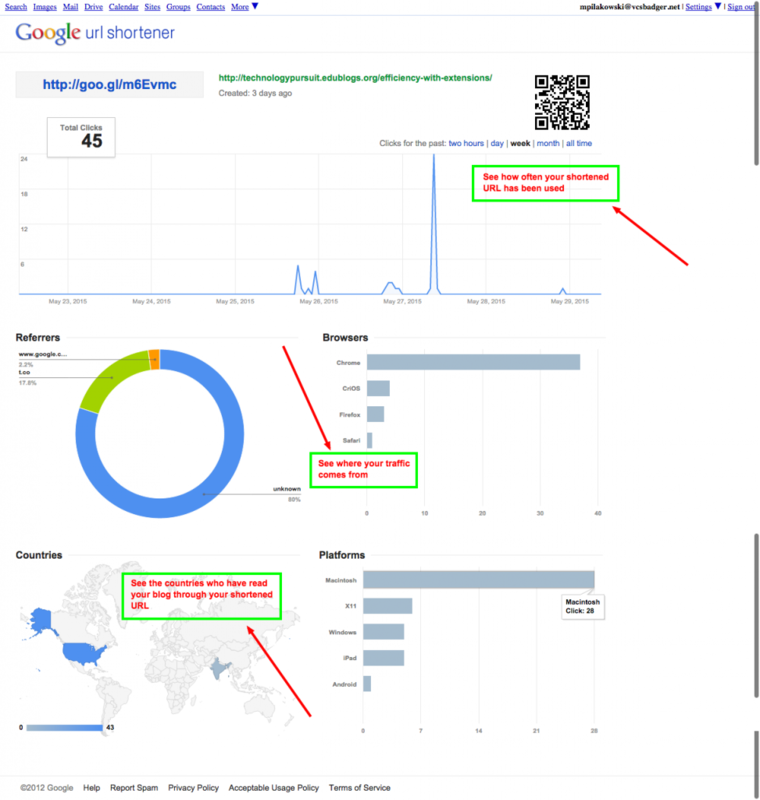 Not only can you see how many people have used the shortened URL, but you can also see the referrers, the browsers, and even the platforms. My 6th period Expository Writing class accused me of bragging about my magical skills when I showed them the new Google Classroom banner I made of them. So, I told them they could choose their own banner. I should also add that 6th period has a friendly rivalry with my 5th period Expository Writing class. And by friendly rivalry, I mean that I’m wearing a bullet-proof vest and SWAT team gear for 5th period when I meet their wrath. I’m also 99% sure I’ll have to take a picture of them and then split-banner the two. Changing the banner is a great opportunity for teachers to build class morale. Students can earn the right to choose the banner of the week, or as my students did, proclaim their ownership of the page with a photo of themselves. I’ve waited for this day to arrive–the day when I get to choose my own banner from a photograph of my choosing rather than the selection Google provides. When choosing an image, remember that your class name will appear in the middle of it (and your picture will show up on the student side), so it’s important to choose a background that will not obscure the name of the class or look strange if your pic is thrown in. If I had my way, I’d like the option to get rid of the class name (and pic) entirely. Images do need to be at least 800 pixels by 200 pixels. 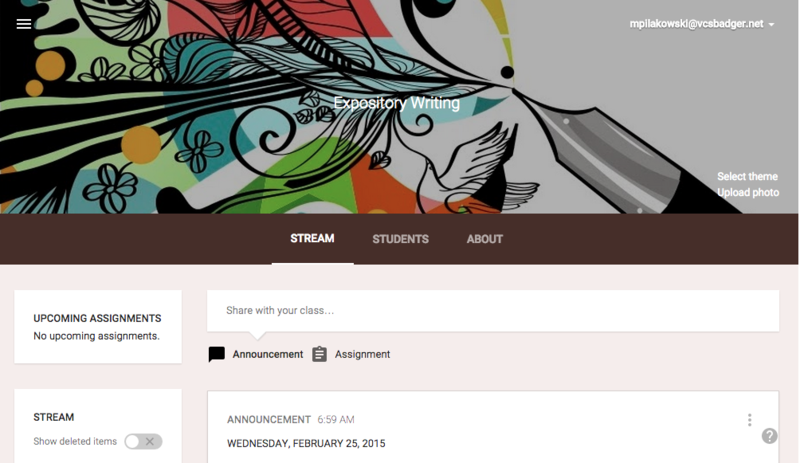 Larger isn’t a problem; you’ll be prompted to crop within Google Classroom. I was so inspired by these posts at Medium.com and Teachersfortomorrow.net. In short, two teachers share teach together in two different classrooms 150 miles apart. 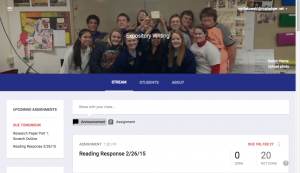 The collaborative duo pull off this feat with the use of Google Hangouts and PearDeck. They each use two projectors in their respective classrooms; one projects the Pear Deck presentation, while the other projects the students from the other classroom 150 miles away. While I don’t plan to use this technique in my immediate future, it does open up more possibilities for distance learning. Since anyone globally can enter an open Pear Deck presentation if he has the PIN code, a teacher could instruct countless students at one time. 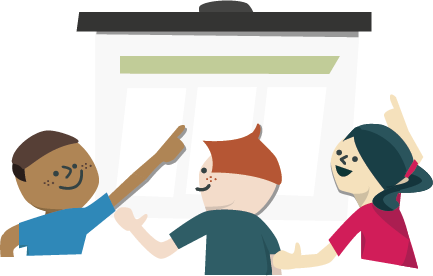 Pear Deck and hangouts provide a platform to merge the worlds of traditional classroom instruction and pure online instruction together. You get the benefit of face-to-face human interaction through Skype and Hangouts while being able to continue education from hundreds–or thousands–of miles away. 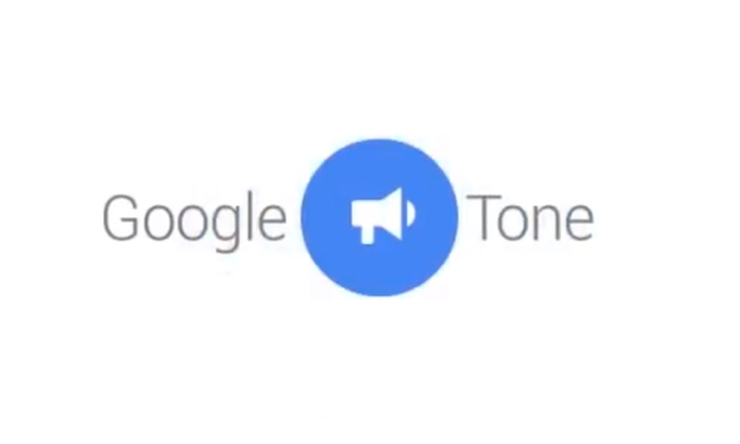 New Google Read and Write Highlighting Tools! 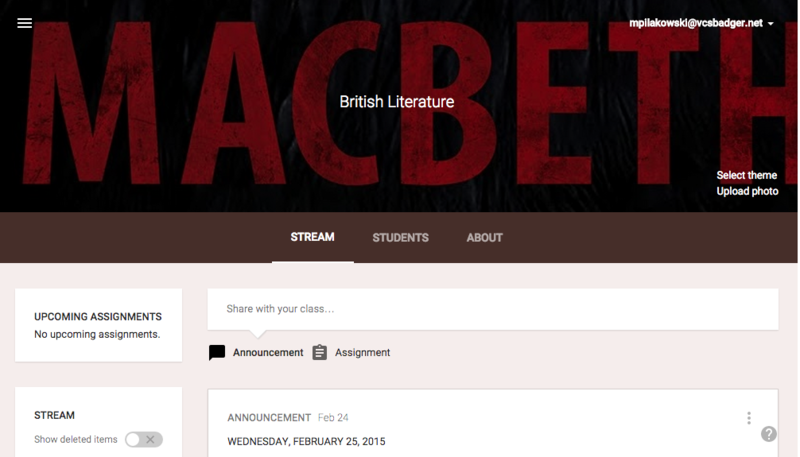 We tried out a new add-on in my Brit Lit class today: the Google Read and Write highlighting tools. The current highlighting tools in the Google toolbar aren’t exactly the easiest to use, but this add-on made highlighting so much easier! We’re smack in the middle of a Jonathan Swift/satire unit, and we’re prepping to read “A Modest Proposal.” Today we watched a Stephen Colbert clip that happens to be formatted just like an essay. After watching the clip, I showed the students a transcript version (slightly altered to be more for the PG-13 crowd) and we reviewed essay structure. Last semester we practiced highlighting thesis statements in green, main ideas in yellow, and supporting details in pink. This strengthens both their understanding while reading non-fiction texts and helps them structuring their own non-fiction texts. Instead of the clunky Google toolbar highlighting, we used the Read & Write tools–so much easier! With color coding, students can see the patterns in non-fiction writing, which increases their reading ability as well as their writing ability. Since my objective the next two weeks is to help them develop ideas in their writing, we did a reverse T-chart of this writing, analyzing the main points and then analyzing the different supporting details for each of the four points. We did the T-charts the old-fashioned way: plain old pencil and paper. But today was truly a hybrid class period: Reading (hard copy books, and ebooks on phones, and iPads),Vocab review on Pear Deck, online video, online text & highlighting, and the classic pencil to paper & whiteboard modeling work. And to be honest, that’s the way I like it. A little something for everyone, and it keeps them moving and always doing something new that appeals to their style of learning. My Business English students are studying about applying for jobs, and one of the obvious, and probably most important, lessons is putting together a resume. In the past I’d used the Education Quest website, which I liked because it provided a few different formats for students and had a simple “fill in the blank” format. The downsides of the site were 1) students weren’t consistent with formatting, such as capitalization and spacing; and 2) the site requires a login. Not a big deal–it’s free, after all–but then it’s another login and password they have to remember. In a few months after they graduate, they’ll forget the website name completely, and then they’ll have to start from scratch. 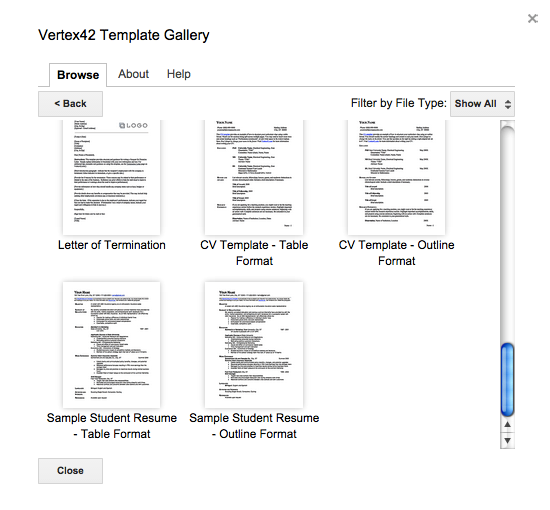 This year, I found this add-on in Google Drive: Vertex42 Template Gallery. There are templates for dozens of projects, from lesson plans to calendars to billing statements. I found a student resume template and, using Doctopus, copied a basic resume template to a document for each student. Then all my students had to do was change the information to reflect their own lives. They had the power to delete what wasn’t applicable. 1) All the resumes look the same. However, they’re all walking out with a really solid resume that is beautifully formatted. If four of them applied for the same job, sure, an employer might notice. Probably not likely, though. 2) Students don’t get the experience of forming a resume from scratch. However, my objective in Business English is not in learning how to format word documents. It’s to use precise language to sell oneself in a resume. Using this template allows students to focus on WHAT they’re writing rather than how to set tabs and alignments. 3) A few students still fought the template somewhat when they tried to individualize it, as often happens when docs try to auto-correct. This wasn’t a major issue, though. Overall, using a resume template like the one provided by Vertex42 Templates add-on has produced the best resumes I’ve yet seen from students. It’s something I’ll definitely continue to do next year! Back in my elementary years, I remember writing sentence after sentence out of our grammar textbooks, selecting the correct verb from the parenthesis. Hours upon hours spent doing this. Thanks to Pear Deck, I can teach a grammar concept and check student understanding in a fraction of the time. Note that this is the teacher view. Students only see the right portion of the screen on their computers and on the projector screen. On the left I can see all the students who are logged in. After a short lecture, we do some practice problems. This is where the magic of Pear Deck comes in with its drawing component. These are the steps I follow to set up my practice grammar slides. 1. I type the practice sentences into Google Drive. 3. Go to your Pear Deck deck and on the chosen slide, upload the screenshot. 4. Last, I double check that I’ve clicked on the “Drawing” option on that slide. This allows students to draw or type on the slide on their laptops or iPads. Here is a teacher view of a “drawing” slide. On the right hand slide is what the students see and can “draw” on. On the left hand side, I can see a thumbnail of each student’s screen. On my iPad, I can see how each student is doing at a glance. Although I do a lot of walking around as students complete the problems, this also allows me to see when students are nearly done. Then I click the “eye” button, which switches the master slide to a scrolling window of all the student screens. I choose one at random (or the one that has a really cool rendition of the Tardis, as seen above) and we go through the answers. No embarrassment if one is wrong since no names are visible. This method is great for formative assessment, and it allows students to make mistakes without embarrassment. The drawing slide is a fantastic tool in any content area. Since any image can be uploaded for students to draw or write on, the possibilities are countless. Last summer at the Great Plains Google Summit, I learned how to embed video into a Google form. I’m sure a million people knew how to do this before me, but what a great trick–especially on a substitute day. All the students have to do is go to their gmail, click on the link, watch the video, and answer the questions. 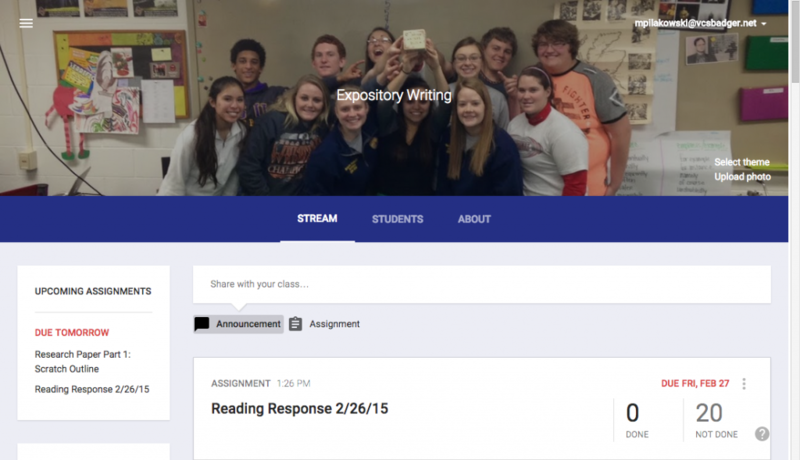 Bing, bang, boom–great lesson plan! Until I tried it for the first time. Our school has youtube locked down tighter than the Hope Diamond, so the video was unaccessible. I asked our tech coordinator extraordinaire to open up the video, but still no luck! Alas, I ended up playing the video on the projector and they answered the questions on the form. Ever since, I’ve put a hyperlink into the directions on the Google form, so students can go to YouTube, watch the video in one tab, and answer the questions in the other. Is it a big deal that they have to separate into two windows to do this? Not really. It’s just…not as spiffy. I haven’t had a chance to check its efficacy, but I’ll find out in the next two days. 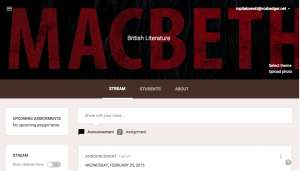 I’ve embedded YouTube videos to my classroom blog before and, once they’ve been opened on the filter, they’ve worked. Hopefully this will, too.